The SNB Forum thread about the RT-N66U has been one of our most active with 478 posts and 80,000+ views as I write this. And our review of the "Dark Knight"'s predecessor, the RT-N56U "Black Diamond" continues to be our most read review each week—almost a year now after it posted. This is an awful lot of excitement for a single-band an N600 Gigabit router with a few USB ports. But there are enough people who think buying much more routing throughput than they could ever even hope to use gets them a better router, no matter how many times I tell them it doesn't. Those folks who got worked up over the "Black Diamond" will find even more to go ga-ga about with the Dark Knight. First, it's Broadcom-based, which opens up the possibility of alternate firmware support, unlike the Ralink-based RT-N56U. While DD-WRT isn't yet available, TomatoUSB (shibby) appears to be. But I'm getting a bit ahead of myself. Let's start with the basics. The RT-N66U is a simultaneous dual-band three-stream "N-900" router with one Gigabit WAN port, four switched Gigabit LAN ports and two USB 2.0 ports that support drive and printer sharing. "N-900" means that it will support 450 Mbps link rates when both radios are set to 20/40 or 40 MHz channel bandwidth. The first thing that struck me about the 66U was the size of the box it came in, which is almost 16" wide. The router itself is only about 8" wide, which is about the width of its primary competition, Cisco's Linksys E4200V2 and NETGEAR's WNDR4500. So the main reason for the bigger box could be to impress naive buyers (Gee, Martha, if the box is bigger then it must be a better router!). Figure 1 calls out the lights, ports and switches on the front and rear panels where you can see that ASUS is making a few moves counter to current home router design trends. They have included a full complement of stylish blue front panel link/activity indicators. But more notably, they are using external, upgradeable antennas. This will excite those who like the idea of being able to install higher-gain antennas. But in reality, it's difficult to find higher-gain dual-band antennas. There is also the potential of reduced performance from using dual-band vs. separate single-band antennas. And there is always WAF to consider. ASUS decided to emulate Cisco and asked the FCC to delay the release of the internal photos it filed, so I was going to open up my sample after I finished testing. But a little searching turned up some very nice photos in Prohardver.hu's review, which I'm using instead. The Dark Night that is shipping is actually the second revision (B1) of the design. VR-Zone got an early peek at the product last October in its A1 form, which had a fan as shown in Figure 2. Note that the A1 never shipped and didn't even make it to the FCC. The B1 is the first shipping model. Figure 3 shows the board from the current B1 design, with a hefty heatsink replacing the fan (this is the reason why the router is so heavy). This is a smart move by ASUS, since fans fail and are noisy, neither of which would enhance the 66U's appeal. Figure 4 shows the heatsink removed, which doesn't reveal much due to the RF "cans" covering all the good stuff. Note the SD card slot at the lower right, which has some folks excited over in the Forums. But so far, it doesn't do anything and it's not externally accessible anyway. The bottom view in Figure 5 is pretty clean, containing only a lone 32 MB flash device. Reviewer documents that ASUS sent detailed the key components used. 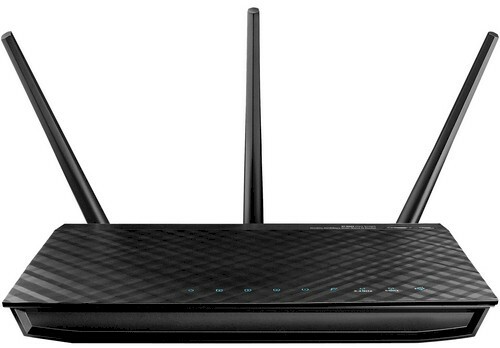 It turns out that the Dark Knight's design is very similar to another dark-colored router, NETGEAR's WNDR4500. Table 1 shows that the designs are very similar for the CPU and radios. Both use a 600 MHz Broadcom BCM4706 processor and a BCM4331 single-chip 3x3 SoC for each radio. The 66U's webpage refers to "built-in Wi-Fi amplifiers", but doesn't provide further details. I'm guessing transmit only and on both bands. I also have to guess on the switch, so a Broadcom BCM53115 is what I'm thinkin'. Given the similarity of silicon, it will be interesting to see how the 66U's three dual-band antenna approach matches up to the WNDR4500's six dedicated-frequency antennas when it comes to wireless performance.